Plans for sustainability for the next 25 years and beyond. Reminder: please be sure to keep your vehicles and those of your guests locked, remove valuables from your car, keep your garage doors shut and doors locked at all times. Thieves may use your garage door opener or Homelink transmitter to gain entry to your garage and your home. Always lock your door leading in from the garage. Don't be a victim of a crime of opportunity. SJSO shared this video with us showing how easy it is to break into a garage: www.youtube.com/watch_popup. Sheriff David Shoar suggests that precautions can be taken by (1) removing the cord, forcing the burglar to catch the small latch-clip, or (2) using a simple plastic wire tie to secure the release latch, rendering the manual release latch-clip inoperable, but being easily removable in the event you need to open your garage door manually. Please respect the speed limit and stop signs! Speeding creates a great safety concern. Please be advised that our speed limit is 25 mph and SJSO regularly patrols our community and issues citations. We have many residents who enjoy walking, bike riding, etc., in our community please be mindful and respectful of our community and our neighbors. 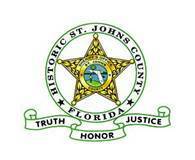 Residents of St. Johns County can be notified of public safety issues by high-speed telephone emergency notification services. The CODE RED system gives county and city officials the ability to deliver pre-recorded emergency telephone notification/information messages to the entire county or to targeted areas at a rate of up to 60,000 calls an hour. Officials from the Sheriff’s Office, Emergency Management, St. Johns County Fire Rescue, St. Augustine Police, and St. Augustine Beach Police Department have been trained on the system to ensure all citizens can be informed of any public safety issues. The system can be used for a variety of events to include, but not limited to, hazardous weather conditions, fires, bomb threats, gas leaks, missing children or adults, escaped prisoners, hazardous material emergencies, or sexual offender or predator notifications.